Reena Roberts and her husband, Mike, went in for an ultrasound. Even the Missouri couple’s sonogram tech didn’t quite understand what the father-to-be was seeing. Mike knew that his eyes were not fooling him: She was not pregnant with a baby, but she was clearly expecting a… car! The couple couldn’t help but have a long laugh about it. While many parents believe they see angels or blessings in their ultrasounds, this family seems to have the premonition of a new car! Mike shared the photo on Reddit, and the image quickly went viral as commenters tried to determine which car it was. Some suggested it was a Nissan 370Z, while less-impressed posters joked that it was merely a PT Cruiser. “We know it’s a boy car,” Reena told CNN. Mike likes to think of the car in the oven as a new Bugatti, one of the most expensive cars in the world. One thing is for sure, whether the kid joins NASCAR or not, I am sure he’ll get quite the chuckle out of knowing he was famous before he was even born! Mom has a pretty good nickname for her unborn son as well, calling him the “all-new Ford Fetus.” It definitely has a ring to it, don’t you think? 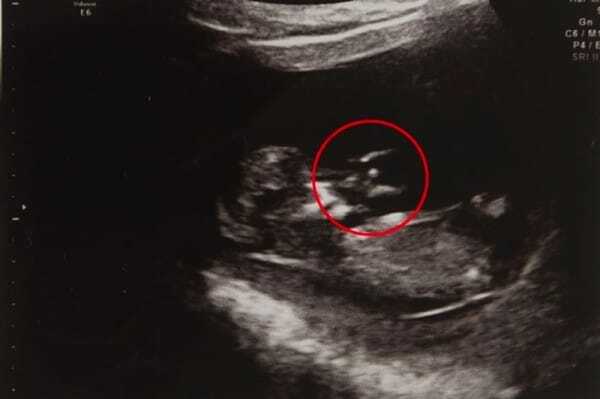 Have you ever encountered any bizarre ultrasound photos? Let us know in the comments. Please SHARE this story if it put a smile on your face today!